Questions have been raised on a forum about the activity of paying dinners. Here is what I answer. I would like to make a comment about the activity of paying dinners. I am absolutely not forced to give specific information about the financial activity of my dinners. But I prefer to give information which will explain that when I say that this activity is not profit oriented, it is reality. I have founded the company « Vimpériale » (combining the word vin and the word Impériale) in 2000. I brought a capital of 300.000 € to finance the stock of wine, the main financing coming by money that I bring in an account at my name. I finance the stock by inputs of cash but the stock belongs to the company. 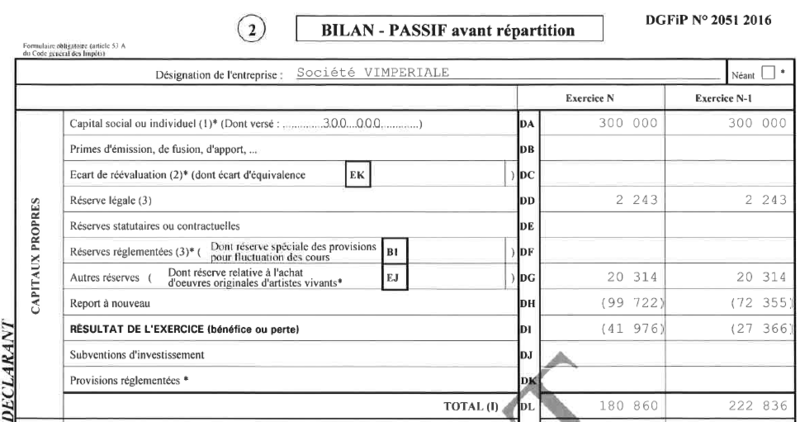 On the document dated 2016 (up right on the document) which gives capital + reserves, the column « Exercice N-1 » is 2014 and « Exercice N » is 2015. Before the beginning of 2014, the accumulated losses was 72.355 € minus reserves of 20314 and 2243. The loss of 2015 is 41.976 €. So, at the end of 2015, what remains of the 300,000 € of capital is 180,860 € which makes a loss of 40% of my input in capital. Any finance man would say that this is not particularly a profitable business. I have no salary in the company, no fees, no dividend, nothing. So, if I say that I do not do this activity for making profit but in order that my wines are shared, this is reality. I have been the chairman and CEO of a company making sales of 1 billion € in the steel industry. My company was quoted in the French Stock Market and I have been used to produce sincere accounts. To give an idea, the sales of Vimpériale represent 15 minutes of the annual sales of my previous company, if you count 250 working days and 8 hours a day. One could say : you make a profit on the reevaluation of the stock because of the price increase. This is true but then we would have to count the mortality inside my cellar and the huge costs or maintaining a building of 750 square meters at a constant temperature, costs that I pay personally. So, all in all, my passion for old wine is a costly hobby. One last remark : with 200 dinners I have opened 2,213 bottles. Not 100% of the wines came from me because I count the annual dinners that I organize with winemakers, who bring their wines. Let us say that I have brought 2,000 wines in 15,5 years. In 15,5 years there are 806 weeks. I imagine that it is extremely necessary to make remarks about a huge company like Vimperiale which sells through dinners 2.5 bottles per week. Such a huge conglomerate represents a big player in the wine industry which needs a constant surveillance. Cette entrée a été publiée dans billets et commentaires le 2 avril 2016 par François Audouze.